It’s been a wild ride for the most important man in football. The role of the manager, British journalist Barney Ronay asserts, has developed dynamically, flourishing despite the multifarious perils of a thankless profession. 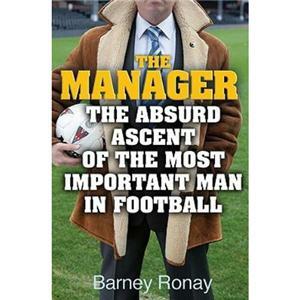 That ascent is the subject of The Manager, an entertaining if not particularly enlightening read. The audacious Ronay would surely snigger at any reviewer accusing him of comprehensive analysis or meticulous research. The Manager is too free wheeling for that nonsense. It is by turns a thematic history and a collection of anecdotes, but it is always a hilariously irreverent take on the increasingly ridiculous reality of top-level English football. To enjoy The Manager, you must accept it for what it is: a charming narrative, but no great work of non-fiction. It’s not that Ronay is incapable of seriousness, he just chooses to avoid it, like a rebellious elementary school student too bored to resist clowning around. Ronay rejects contemplative analysis in favor of a more carefree, jokey approach. His prose is a concentrated mass of adjectives and allusions, a sometimes eloquent, sometimes annoying knot of compound descriptions. When Ronay bothers to consider actual history, he is creative and ambitious. He unifies whole decades under common managerial traits and mannerisms, treating his subject as a reflection of wider trends. Ronay argues that Malcom Allison — one of the first celebrity managers — was a product of 1960s -“rock-star”- culture, and that Brian Clough’s larger-than-life personality meshed with the made-for-TV drama cultivated by football media in the ’70s and ’80s. Sympathy, though, is never in short supply. Early in the book, Ronay identifies the brutal significance of the sacking, an event he considers the final confirmation of a manager’s existence. One chapter recaps Graham Taylor’s ignominious England career, in particular the savage press reaction to England’s failed 1994 World Cup qualifying campaign. Ronay carefully outlines the contrast between the reality of Taylor’s generous personality and the unflattering depictions propagated by The Sun. He casts Taylor as an abused and unfortunate victim of football’s chronic forgetfulness. Without ever threatening to be anything more than funny, Ronay displays an acute understanding of the sport he chronicles. He maintains an honest and daring stance, always remembering that, despite incessant media attention, football is just a game.